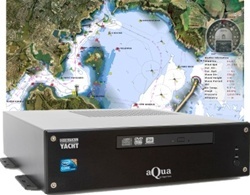 The new Aqua range of marine PCs from Digital Yacht bring affordable low power computing to every boat. Four standard models are available but they can also be customized to a particular specification if required. All models utilize the latest generation of Intel processors and a highly efficient DC power supply to offer exceptionally low power consumption (just 15W to 20W on the Atom based units) as well as ultra fast computing capabilities, especially on the Intel i3 based AquaPro. AquaPro is designed specifically for high speed, demanding 3D charting and bathy-metric applications. It utilizes an ultra-fast Intel i3-530 processor and 4GB RAM for exceptional performance. 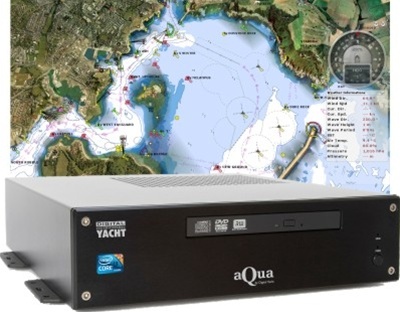 It’s supplied with Windows 7 (64 bit) as standard and can also be fitted with an optional internal 4 port isolated NMEA interface with built in multiplexing functions. This allows complex NMEA systems to be integrated into the PC. A 64GB solid state hard drive is supplied as standard for the ultimate in reliability and speed. Dual NMEA Input/Output Ports: Use USB-Serial adapter in external USB port. Available as option.